For receiving data from the Arduino, my Raspi sends a byte. But i always have to send 2 bytes for the correct response. Is it even possible for the Arduino to response on the first byte? 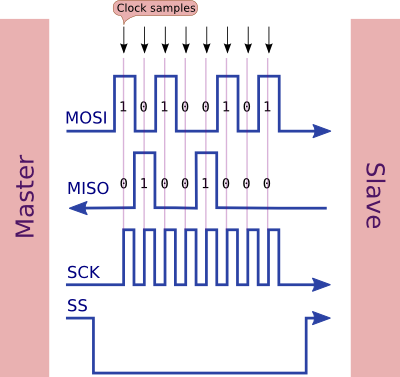 Because of the way SPI works, the slave cannot respond to the first byte in a meaningful way. It can send something (eg. 0x00) but not a response. You can see that as the first bit is received by the slave, it also has to send a response. There is no way that this response can react to the 8 bits, 7 of which haven't been received yet, by the time it has to send the first bit of response. But i always have to send 2 bytes for the correct response. You don't have to send 2 bytes all the time. For example, you can send one byte (eg. "send me the temperature") and then send zeroes after that, while you read back a (say) 4-byte temperature. So in this case you send 5 bytes to get a 4-byte response. The only way you can respond on the first byte is if the Arduino already knows, and is primed, what to send on that byte before it begins to be clocked into the Arduino. It is normal to have to send at least 2 bytes - the first is often used as either a register address, or a "read register" command. Is it even possible for the Arduino to response on the first byte? Yeah. There is nothing preventing your slave to respind on the first byte, so long as your code allows it. Not the answer you're looking for? Browse other questions tagged arduino-uno spi raspberrypi or ask your own question.